He sculpted a pigeon out of marble that was mistaken for real by a flock of flying birds, who halted to gather around their stationary avian pal. The creature chiseled out of stone even fooled a hungry cat that pounced on it only to break it. Skill personified in the hands of Maliramji ustad who set the benchmark for sculpture making with his exemplary competence at the art. 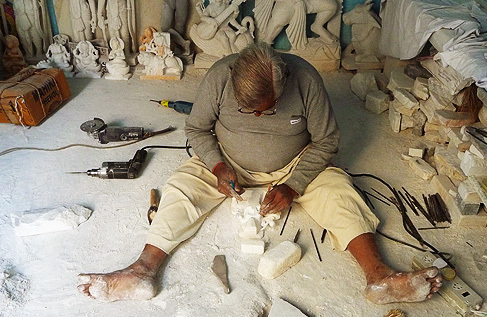 Today every sculptor in Jaipur’s ‘Khazanchion ki Gali’ wishes to imbibe an ounce of that competence as he chisels the stone into an awe inspiring three-dimensional wonder. The entire lane is dotted with shops and workshops of marble sculptors who carve bodies of gods and goddesses out of marble and granite. About 250 years ago, Sawai Jai Singh II summoned these sculptors to Jaipur for their skill, as he shifted the operating capital of his empire from Amer to Jaipur. 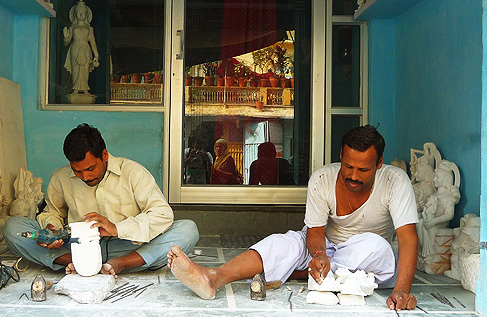 At that time sculpture making was seen as a forte of the Bhramins, who were believed to be descendents of Atri Rishi. They were specifically commissioned because of the religious significance of the sculptures of deities. But today, an overwhelming 4 to 5 thousand people from across the boundaries of cast and creed are pursuing this ingenious art here. In the words of Kanhaiya lalji Atri, who has inherited the legacy of this skill for generations, the profession that was initially limited to just one lane, has now spilled over surrounding lanes which are locally recognized as ‘bhindon ka raasta’, ‘kalaamji ka raasta’ and ‘hijaron ka raasta’. And to add variety to their work, in the present times, apart from marble carving/sculpting for temples, even politicians and other native popular figures are modeled in stone. 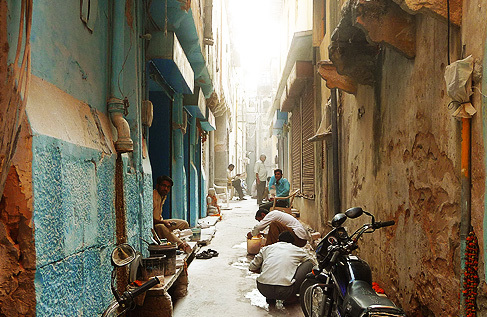 The limiting scapes of the current urban scenario within the city restrict the spread of this ever-flourishing industry. Therefore, even though ‘Khazanchion ki gali’ is the main seat of activity for the art, some recently established setups on the outskirts of the city also assist these artisans. Especially mentionable in this context are those who supply the boulders or the roughly carved figures. Only final finishing, buffing and painting are carried out within the workshops in these lanes. Marble is the last word in stone. 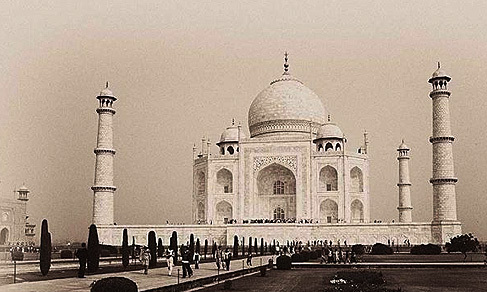 Its sheer opulence draped in flawless white can sting the sight and at the same time soothe it. Through centuries, Rajasthan has emerged as the magical fountain from which marble eternally springs out. The historical accomplishments of this stone range from the unmistakable wonder of the world – The Taj Mahal in Agra to the much acclaimed carving of the Sun God in the Dungarpur area. The marble that is used for the art of sculpting is mined from quarries situated within a 100 to 150km radius around Jaipur and is acquired in the form of big boulders. The quality of the marble is defined by its whiteness and density. The less porous marble is more superior in quality and hence more expensive.Makrana marble, black marble and granite are the preferred choices for sculpting. The two-dimensional drawings of the imagined sculpture are first sketched on a boulder, roughly the size of the sculpture, with some margin for wastage. The sketch is translated on stone using a scale, compass and pencil. 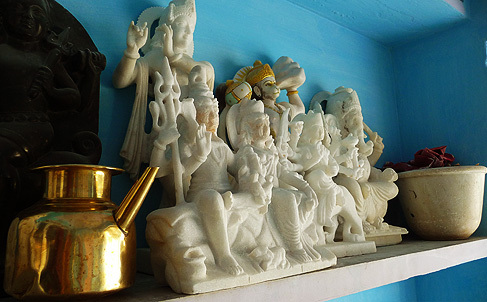 Artists inheriting generations of practice and command over their dexterous hands can directly start sculpting idols of Shiva, Radha-Krishna, Hanuman, Ganesh or any other deity, without the need of any guiding tools. With the process of Hammering and chiseling around the sketch, the extra material is done away with. To reinforce the finer features like facial expressions, folds of the skin or fabric etc, a sketch is drawn again on the stone. Eventually, the image is chiseled to perfection three-dimensionally. In years following 1980, eroding hand machines have been employed to ease the labor of chasing, filing and finishing. 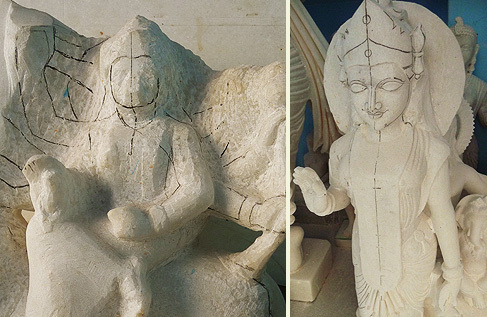 A mixture of powdered red stone and water (geru) is then applied on the marble sculpture, essentially to demarcate the regions on which finishing is pending from the rest of the stone canvas. Finally the most intricate features like the pattern on the fabric, the design of the ornaments, are engraved into the stone. 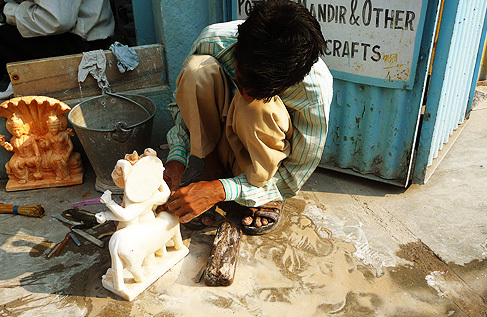 The sculpture is roughly polished using a long stick made of porous sandstone (batti). This erases the redness caused by geru and indicates the finishing of the area. The eventual finishing and polishing is done using buffing machines. Even as the bazaar continues to dwell in the narrow lanes of the heart of the city, a considerable number of workshops have been moved to the outer parts. This is a result of a government initiative to check on the noise pollution (caused by the hammering, machinery used to drill and chisel the boulders) and dust levels that harm human health. Marble otherwise is quite an eco friendly material. With the transportation becoming an easier facility, the demand for these marble splendors has only increased. For those who engage in this art, believe their labor of love materializes in the sculpted idol that deceives and bewilders the on lookers. Covered in the hazy white dust, their appearance is as genuine in existence as is that of their creations. 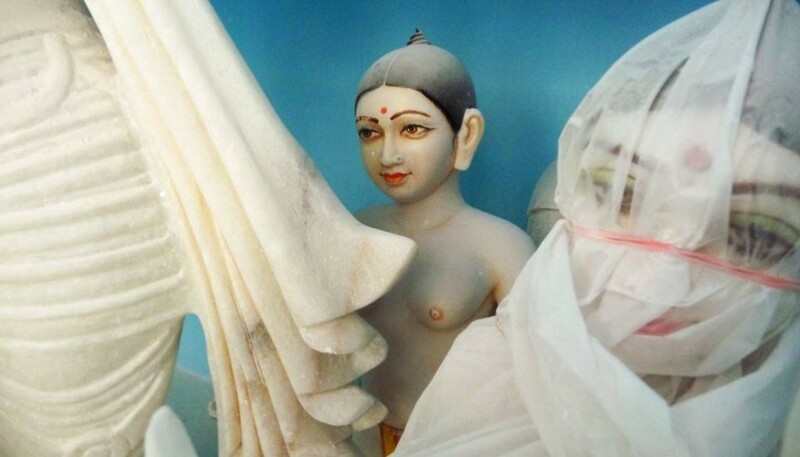 The artists, who share a major part of their day with these marble deities, appear to be in a constant non-verbal conversation with their stone mates. thanks for these beatiful words….these helped a lot in my project.